It had seemed so far that all the Auvergne peaks we had scaled – if that’s the right word, perhaps ambled to might be better – had easy access for the downright bone idle but the last of our hills ventured a little more into the territory I am happier with. 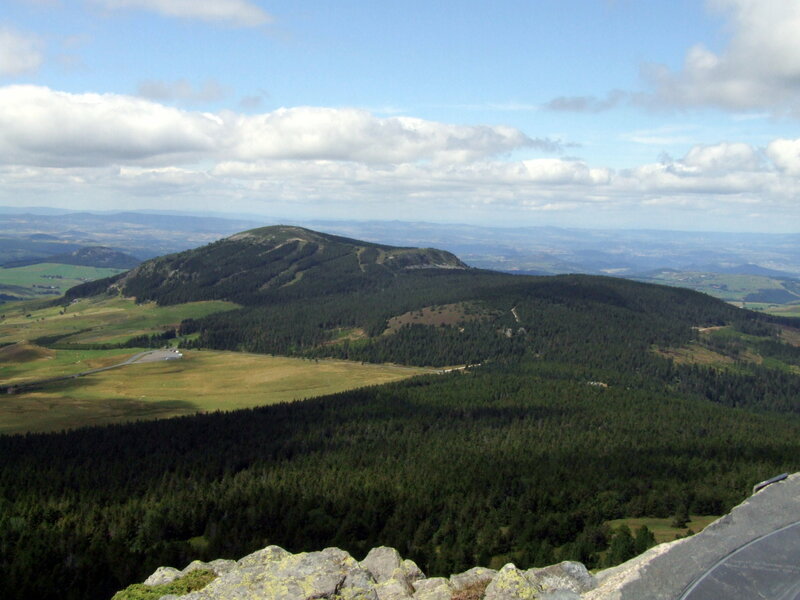 Situated within – and the high point of – the province of Haute Loire was our last Massif Central peak, Mont Mezenc which at 1753m rises away to the East overlooking the Rhone Valley. Haute Loire contains – as you will no doubt have guessed – the headwaters of the Loire River and as with the Dordogne, will be totally unfamiliar to the majority of visitors who flock to Orleans and the wine region far to the North. Onto the open roads of Haute Loire and we soon became aware of mysterious figures lining the roadsides. These at first were a puzzle but with their epitaphs displayed, simply stating their ages, it soon became clear that they were memorials to people who had met an untimely end on these roads. The ages followed a distinctive pattern too. Almost all – over 90 percent I would say – were either in their teens to early twenties or sixty plus – Very few victims were 30’s to 50’s. It seemed to be the young inexperienced drivers – as one might expect – but also the more elderly who became casualties. I had noticed already that the French, who are so civilised at mealtimes and on family occasions, seem to turn into dangerous psychopaths once behind the wheel of an automobile, treating the car more as a weapon of war than a mode of transport. Observation of some of the more suicidal driving techniques did reveal that many of those overtaking on blind hills or into the paths of speeding trucks were indeed grey haired drivers rather than all youngsters, so bearing out the macabre message of the roadside figures. Keeping a safe distance from the more dangerous looking OAP’s, we’d journeyed east on the D15 as we at last headed for Mont Mezenc, later leaving this highway to troll along on quieter roads through rural Le Monastier. Now the road climbed steadily into the hills to pass the isolated farming communities around Les Estables, a charming village on the edge of much wilder looking country that brought to mind the remoter parts of mid Wales. 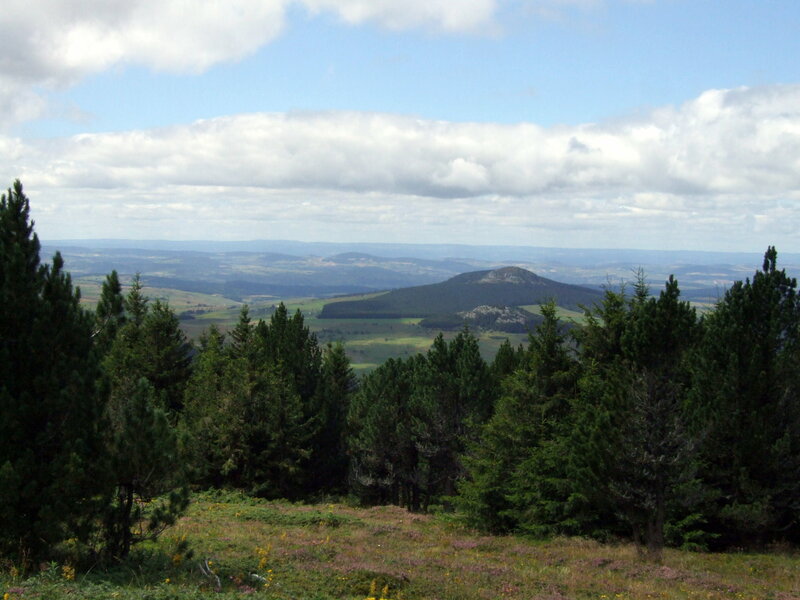 As the hills become mountains and the roads more minor we climbed steadily over bare moorland to enter a coniferous forest cloaking a high ridge above – marked by the Croix de Boutieres – where we parked up and set off on foot. There were a few cars here but no crowds and the people we saw were dressed for walking and carried rucksacks instead of poodles in baskets. On the far side of the col we were greeted by a sweeping panorama of winding valleys and gorges that led the eye down towards the hazy lowlands but our route followed the path off into the woods on the northern side of the road. 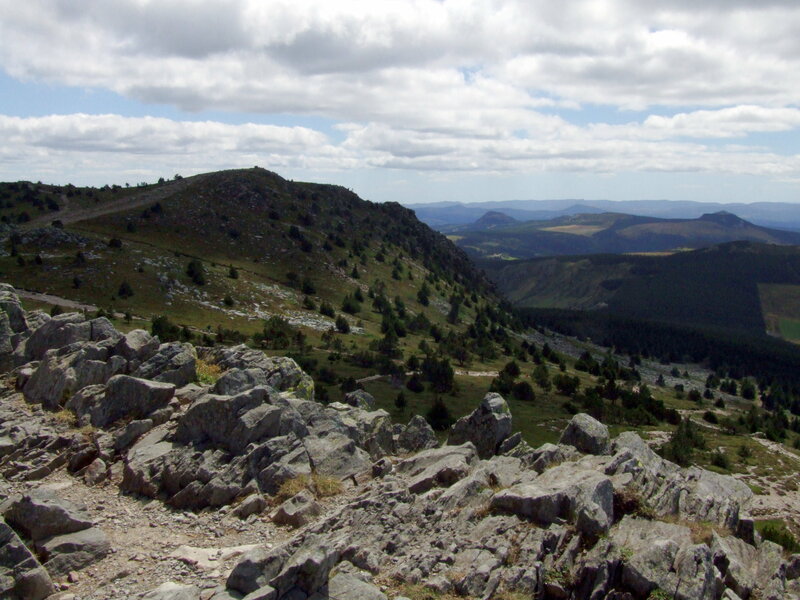 This ridge crossed by the col is in fact part of the dividing watershed between northern and southern Europe with the area behind dropping to the north-flowing Loire and that ahead to the Rhone, ultimately leading to the Mediterranean at its end. 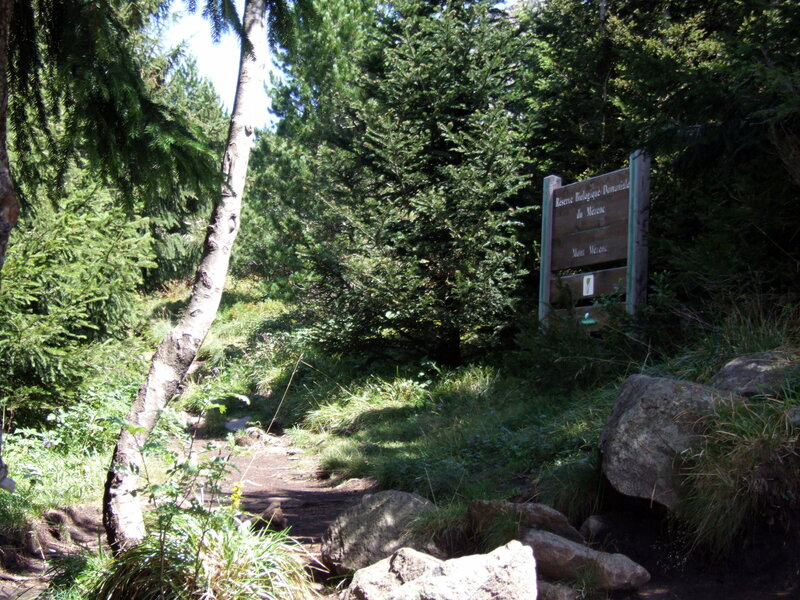 The path effectively follows the northern side of the watershed towards Mont Mezenc though the distant views are obscured by trees until you approach the peak. Despite not being far from the road this ascent was completely different in character from the Puy de Sancy and Plomb du Cantal – no gondola ascends Mezenc so far fewer people were encountered as we trooped through the pinewoods on a good trail with occasional glimpses of the open country through which we had journeyed that morning. The peak itself gradually appeared to our right with heather and scree slopes rising to the low cliffs that marked the edge of the summit plateau. Above the trees the path curved around to the right and continued up to more level but stony ground having avoided the screes and a short walk brought us to the highest point in Haute Loire. 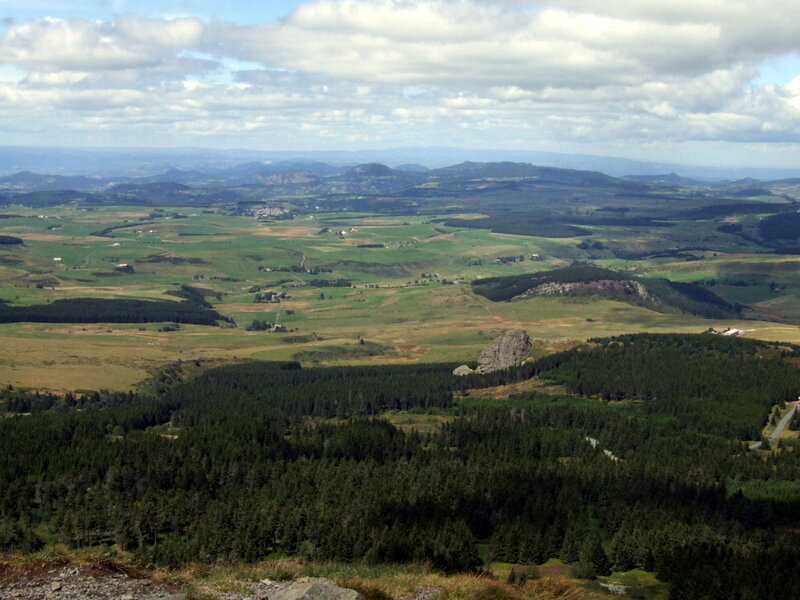 All around was the fresh mountain breeze and above, the big skies for which the Auvergne is known. This peak felt much wilder and more remote than the others we’d climbed despite the fact that an easy walk had brought us to its summit. Eastwards the tangle of limestone river valleys of the Ardeche Gorge system stretched out below, gradually fading into a distant summer haze over the lowlands of Provence somewhere near Montelimar. Beyond at a great distance could be seen the faint snowy outlines of the French Alps – probably the Ecrins though the mountains themselves were at the very limit of vision and not recognisable. The other side of this stony summit plateau which actually has 3 tops fell away towards the rolling uplands of Haute Loire – an equally compelling landscape of tiny red roofed villages huddled beneath small hills in the midst of a vast sweep of dark forests and endless patterned fields over which the cloud shadows chased. Far beyond rose the dark hills of the Massif du Sancy and even further away on the horizon, the distinctive cone of the Puy de Dome near Clermont Ferrand where we had began our journey. 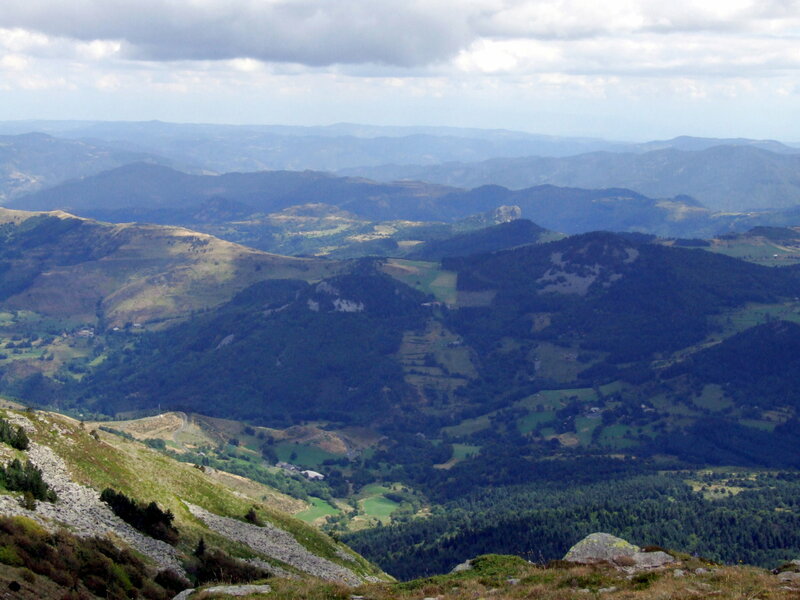 Back <<< to part 2 Plomb du Cantal >>> These three posts are exerpts from Tales From the Hills – chapter 17 entitled In the Auvergne. This entry was posted in France, Hiking, outdoors, travel and tagged Auvergne, Europe, France, Haute Loire, hiking, holidays, Loire, massif central, mountains, nature, outdoors, photography, travel, vacation, walking, wilderness, writing. Bookmark the permalink. these 3 articles bring back many memories – even the ‘eccentric’ driving !